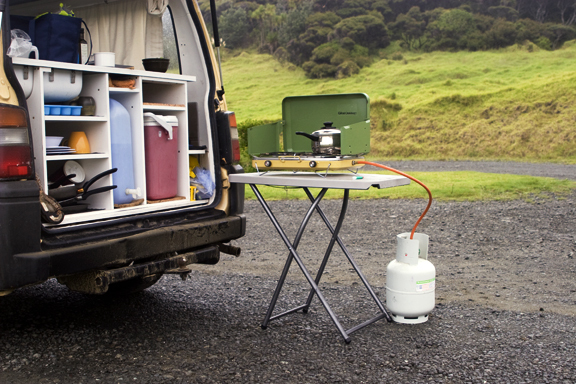 It was our first time testing our campervan equipment and we had driven all the way north to Cape Reinga, through hours of farms and vegetable stands run on the honesty system. Despite a misty rain we were excited about our beachfront location and we began cooking under the protection of our hatchback door. We felt like smart investors, taking pride in our portfolio while others juggled with lemons. When the sun disappeared we jumped inside our van and eased under the cool sheets, ready to fall asleep to the hypnotizing sound of waves. With a quick push of the thumb Barret cast a light on the ceiling. I grabbed a book and with a swoosh our intruder was decimated by literacy. Just before turning off the light we noticed small shadows vibrating around the perimeter of the beam. Barret’s cursory surveillance revealed that our guest had not arrived alone. Between a week of rainy weather and open doors, a cloud of mosquitoes had materialized in our car. Of course the only things missing from our arsenal were mosquito nets and bug repellent. My heart hit the floor when I realized the fight we faced for a good night’s sleep. Thumpp. Thumpp. Piing. Bang. Piiing. Thumpp. Our killing spree lasted three hours. At the end our ceiling and curtains were smeared with powdery black corpses and blood. Exhausted yet triumphant, we were finally able to turn off the light and go to sleep. Sorry you had to go through this learning curve. The scenery was worth it I would hope. Really humorous description though.